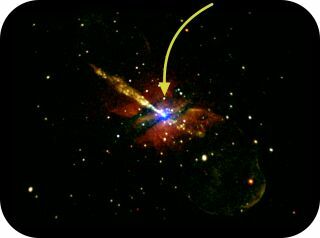 The yellow arrow in the picture identifies the position of the black hole transient inside the galaxy Centaurus A, which is 12 million light-years away from Earth. The location of the object is coincident with gigantic dust lanes that obscure visible and X-ray light from large regions of Centaurus A. An international team of researchers detected a so-called "normal-size" black hole in the distant galaxy Centaurus A, which is located about 12 million light-years away from Earth. By observing the black hole's X-ray emissions as it gobbles material from its surrounding environment, the scientists determined that it is a low-mass black hole, one likely in the final stages of an outburst and locked in a binary system with another star. The object is typical of similar black holes inside our Milky Way galaxy, but the researchers' observations suggest that this is the first time that a normal-size black hole has been detected so far beyond the vicinity of our home galaxy. Its discovery gives astronomers the chance to characterize the population of black holes in other galaxies, they said. The researchers used NASA's orbiting Chandra X-ray Observatory to make six 100,000-second long exposures of the galaxy Centaurus A. Black holes can't be seen, but astronomers can observe their surrounding activity to find them. The lowest-mass black holes are formed when very massive stars reach the end of their lives and eject most of their material into space in a violent supernova explosion. This blast leaves behind a compact core that collapses into a black hole.